Last night, Toronto Blue Jays’ centre-fielder Kevin Pillar appeared to shout a homophobic slur directed at Atlanta Braves’ reliever Jason Motte. It can clearly be seen here. Unlike the quick-pitch, which has been a part of baseball since before Kevin Pillar’s great-grandparents were born (and is a technique currently employed by Pillar’s teammate Marcus Stroman), homophobia and homophobic epithets are not just “part of the game,” nor are they welcome. That is indeed a quick journey to resolution. A whole 15 words from recognition of the problem to absolution. And we still hadn’t learned from Pillar what that “stupid” thing was. Here’s a general rule about apologies – if it does not include a frank admission of what you did wrong, it’s not a real apology. It’s an excuse. While no one could have predicted that Kevin Pillar would have used a homophobic slur, the fact that he lashed out at Motte for quick pitching him, blamed his use of the homophobic slur as “part of the game,” and made himself out to be a victim should come as no surprise. As Mark Twain once said, “The best predictor of future behavior is past behavior” and Kevin Pillar has a track record of selfishness and immaturity. It’s interesting how Pillar’s statement regarding Colabello’s failed drug test quickly becomes a statement about Kevin Pillar’s road to the Major Leagues and how hard of a worker he is. But I digress. Pillar goes on to say that Colabello fell victim to a technicality in the system. Make no mistake, Colabello tested positive for an anabolic steroid, namely Turinabol. Turinabol was the drug of choice for East German and Soviet athletes during the state-sponsored doping programs of the 1970s and 1980s. It’s not something that will show up accidentally in a smoothie from Booster Juice. I’m not sure where Pillar thinks the technicality lies, but according to Pillar, the onus is on MLB to do some soul searching and figure something out so that “hard working” guys like Pillar and Colabello don’t get popped for ingesting 70s-era anabolic steroids. Blaming MLB for a failed drug test and hijacking the topic to promote one’s own work ethic is not exactly the hallmark of maturity. When asked to elaborate on that technicality, Pillar said it wasn’t for him to say. It has been three years since the positive test and the technicality that Pillar speaks of still has not come to light. While Pillar thinks that he would make a great lead-off hitter, his career .303 OBP heading into the 2016 season tells a different story. And it’s not exactly comforting to hear him say that he wants the lead-off role because it increases the likelihood of him reaching the personal milestone of a 200-hit season. It begs the question: how many of those swings outside of the strike zone were made in an attempt to pad Pillar’s personal hitting stats, when a walk would have been what was best for the team? Kevin Pillar has demonstrated on multiple occasions that he’s a selfish player with a predilection for blaming everything and everyone for his own mistakes. Pillar’s gut reaction was to lash out at Jason Motte for utilizing the quick pitch; for making him chase a slider outside of the strike zone. Pillar thinks it’s baseball’s fault that his word of choice was a homophobic slur because it’s “part of the game” (it’s not). In contrast, a mature player would accept the fact that he wasn’t fully-present during an at-bat, take ownership for his mistakes, and tip his cap to Motte for being the better man on that particular occasion. 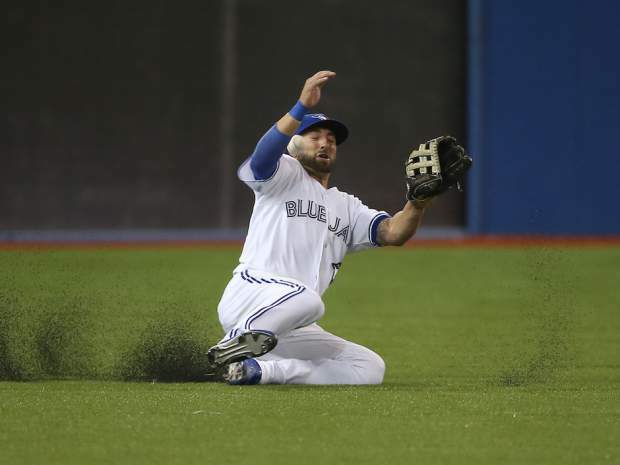 Make no mistake about it, Kevin Pillar is a better-than-average defensive player. When he’s not making TV-dives or embellishing catches to make them look more difficult than they really are, he’s bailing out the pitching staff by covering a tonne of ground in the outfield. It can be difficult to reconcile the bad behaviour of a very good player when he’s on your favourite team. For fans who want to make excuses for him, ask yourself: What would be the first words out of your mouth in the heat of the moment? Maybe a curse word, but most of us wouldn’t dig up such a hateful slur. At least, I hope not. It’s about treating everyone with respect and dignity. Athletes, like it or not, are public figures and should be held to a code of conduct of acceptable behavior in this regard, so a short suspension for Pillar is fair and in order. With Kevin Pillar, there’s a track record of selfishness and immaturity, and as a fan of the Blue Jays, I don’t want to see it continue. I’m tired of seeing Pillar put himself before the team, blame the game of baseball and everyone else for his own mistakes, and refusing to take responsibility for his own actions. The Toronto Blue Jays are building a culture that places an emphasis on character, and based on his past behaviour, Kevin Pillar doesn’t belong. This latest blunder could be the tipping point in Pillar’s career. It’s now up to Pillar to take ownership for his actions and make amends, otherwise he won’t be in Toronto for very long. It’s not welcome, but I disagree with the idea that homophobia isn’t culturally ingrained in baseball specifically, and sport in general. It’s why organisations like the You Can Play Project are necessary. Agree to disagree that homopobia (or any other form of hate, such as racism) are culturally ingrained in baseball. Sure, baseball has a checkered past with regards to both, but I don’t think you can accurately say that there is a culture of homophobia (or racism) in the sport today. Thanks for pointing me to the LGBTQ perspective thread. I’m sure it can be frustrating to have a member outside of a community tell a community how they should feel or what’s best for them. I don’t think that’s it’s explicit hate – simply an underlying casual homophobia that straight people barely notice. I’m in my 40s and I’ve been an amateur athlete my entire life–amateur boxing, curling, a bunch of recreational sports– and I couldn’t possibly count the number of times teammates have used this exact epithet, among others, without even thinking about it. It’s only been in the last few years that I’ve noticed it happening less. But it’s still there. Sure, it’s still there. But what I mean by “culturally ingrained”… is that the systemic targeting and abuse of homosexuals is not part of baseball culture. An example of culturally ingrained homophobia would be Chechnya, where authorities rounded up, detained, and tortured gay men. That anti-gay sentiment is ingrained in Chechnya’s culture and abuse toward homosexuals is part of it. Calling an opposing pitcher a “f—ot” following a strike out is not part of baseball’s culture like throwing the ball around the horn is. funny how you say clearly seen. there is no audio so you have no idea what he said. you are just speculating. only because pillar admitted it that you know. if he didn’t this could easily have been swept away by mlb and nobody would have cared. were you so offended when jd made a similar remark in the dugout that was caught on audio? nothing was done about that because he is a star. and are you not offended by the chief wahoo logo which insults generations of natives? but of course mlb won’t touch that because they make too much money.